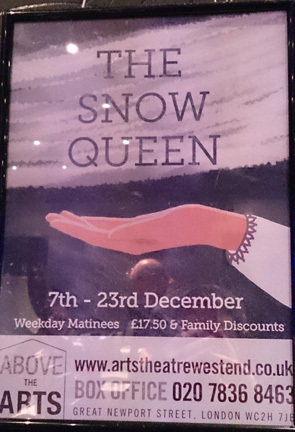 This festive season (7th-23rd December) Wild Ivy Theatre are performing The Snow Queen at Above the Arts Great Newport Street London. I watched their delightful interpretation of this classic story by Hans Christian Andersen on Thursday 17th December and for 45 minutes was immersed in the simplest most embryonic form of theatrical story telling. Above the Arts only opened in March 2015 and is a sixty seat auditorium on the first floor above the Arts Theatre. The venue is rather like a large living room where scenery can be placed around the space, with open benches for viewers situated within the same area. This results in an immersive feeling where the audience can easily become an integral part of the performance. The constraints of a tradition theatre setting are removed, resulting in a much more free feeling experience. I couldn’t help thinking that it was a perfect way of introducing young children to theatre performance, by making it a less daunting prospect. The four actors of the theatre group inhabited all the major characters with great aplomb. Gerda, Kai, Mother, Father, Maid, the Snow Queen, Reindeer, Raven and a fleeting show from the White Fox were all brought to life with a great energy and a lovely sense of fun. Every exaggerated body movement, facial expression and voice change brought storytelling to an elevated level. Stage props were minimal and just sufficient to give a setting context and the costumes simple, basic yet convincing. As there were only four actors and 45 minutes of action these facts helped guarantee a seamless transition between characters to progress the story. Sometimes less is definitely more and it also meant that the imagination of this big kid was fully engaged, for example I chuckled inwardly when the owl voice-overs came on as I envisaged Jane Horrocks (Little Voice) sitting wide eyed in a tree! After the show I made a point of telling the actors how much I enjoyed their performance. They mentioned that some artistic licence was incorporated within their storyline, and I shall have to re-read the book to remind myself of the nuances of the tale. But the adaptation and setting it was performed in took me back to my five year old self marvelling at a picture book delivered by Santa. The innocence and wonder of an enchanting story that had my imagination fired on all cylinders as a child came flooding back forty years later watching the Wild Ivy Theatre. For that I thank them dearly. There are three favourite stories I have always associated with Christmas. This production means I have now seen them all performed on stage. In 2013 I saw Hansel and Gretel performed by the Scottish Ballet in Glasgow. My love of this story I believe comes from seeing it as my first pantomime around 1977. The Alistair Sim black and white film A Christmas Carol has always kept Charles Dickens classic tale close to my heart, although I only read the book for the first time in Christmas week 2014! To my delight I watched a one-man show of A Christmas Carol performed by Simon Callow in the larger Arts Theatre in 2012. He was sensational making every expression; word and slight movement speak volumes. I thought at the time I was seeing a mature actor at the height of his powers give the ultimate theatrical master class. In a similar way Wild Ivy Theatre gave an acting master class in the purest storytelling form. The actors may be in the early part of their careers but if this is a glimpse of their potential I’m sure they will go far. Having seen many theatre shows in my time to think of Wild Ivy Theatre and Simon Callow in the same sentence is praise indeed from me. See a Wild Ivy Theatre production if you can it will be worth the effort. 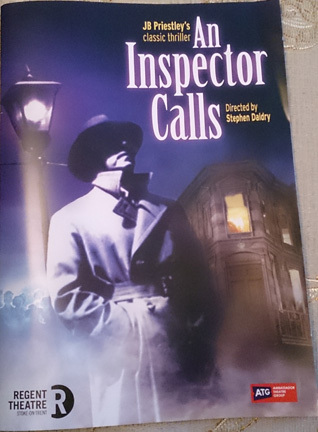 On Thursday 16th October 2015 I went to the Regent Theatre in Hanley to watch a touring production of J B Priestley’s play An Inspector Calls. Alas by the end of it I was somewhat confused, a bit angry and didn’t really care very much about the crux of the story. There seemed to be so much socio/political subtext going on through the stage production, that (for me) the heart and essence of the text was lost! I have never read J B Priestley’s play An Inspector Calls nor can I recall seeing the 1954 Alastair Sim film either. But I did see a stage production ten years ago and although the details are gone, I still remember the “wow what an ending to the story” feeling. Presumably the modern style of interpretation was there in my first viewing, but at the time I knew nothing at all about the context of An Inspector Calls. 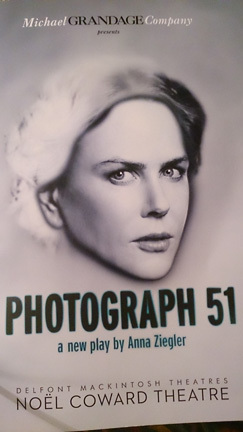 Armed with new knowledge and the memory of a superb traditional BBC TV adaptation from a few weeks ago, I looked forward to seeing the play with a fresh perspective. Sadly from the start all I could do was see “ticking boxes” to fulfil several bits of criteria deemed essential for the underlying sub-text. It began with WWII air-raid sirens and a little boy listening to a radio, so I thought that the setting was going to be in the 1940s. When the curtain finally lifted and the house interior/occupants dress was revealed, it was obviously 1912 the year the play was set in. As the drama progressed and the WWII motifs remained I was utterly baffled, especially as the sirens, radio music and sounds of bombing at times drowned out the actors voices, as they did not use any means of amplification. Particularly bad was the dialogue at the beginning when the Birling party were inside their enclosed “Wendy house mansion on stilts”. I immediately thought they would have to open up the set for anyone to be able to hear properly. In my usual “cheap seat” at the back of the stalls, at times I’ve had to concentrate hard to follow a story, as the Regent does not have the best of acoustics. But with the actors having no amplification and the type of stage setting involved I must have lost about 20% of the dialogue. So with different eras seemingly being juxtaposed together I couldn’t help but think “that shouldn’t be there” far too many times. The Birling’s interior telephone became an outdoor telephone box (I don’t think available in 1912), the dining room interrogation found itself on the hard urban streets of a bombed out city, the WWII radio had no place in a 1912 parlour. The manner of Inspector Goole reminded me of Jack Regan in “The Sweeney”, especially when he rolled up his shirt sleeves and threw his jacket into the gutter and shouted most of the time. Eric Birling the errant son running on with his shirt-tails hanging out and a bit wild eyed made me think of someone coming out of a night-club, not a man having had too much to drink at a home dinner party. And the violence shown between son/mother and father/son reminded me of episodes of “Dallas”! Obviously my mind wandered from the plot quite often, partly as a way of trying to comprehend what I was seeing but mainly because I felt totally disengaged from the story. When I get into a play I almost become part of it and really care deeply about the characters. But this time I just felt remote from the whole thing, perhaps because this modern adaptation was trying too hard to be all things to all people! Much discussion took place with my husband Rob afterwards in the pub and the “era-mix” caused great confusion. From Google we discovered that Priestley wrote the play in 1945 but the story was set in April 1912, so it was a kind of vague though unsatisfactory explanation why both decades prevailed on stage. From the program there was a hinted suggestion that the rejection of Churchill in the polls after WWII could have been reflected in Priestley’s play. But I think that’s reading too much into that, but I could see that the class barriers that began to be questioned during the First World War were even more battered (though not dead) by the end of the Second World War. I was far more interested to discover the play was set in APRIL of 1912 the same month as the Titanic disaster. The irony of that was not lost on me at all, the rich inhabiting the top decks having a better chance of survival than the poor on lower decks. And the gentry mantra of “women and children” must be on a life raft first, does not equate with pregnant Eva Smith/Daisy Renton being cast aside and effectively killed by the same upper class because no one threw her a life belt. It is also the era of the suffragette movement and Eva/Daisy initially fell on hard times through asking for a pay rise and going on strike. Her hard difficult struggle to make ends meet is a direct reflection of the harsh treatment by the authorities of women fighting for more equality. So when patriarch Arthur Birling complains vociferously at the harsh/less reverential questioning directed by the Inspector toward the Birling women, the irony and hypocrisy of the situation is all too evident. The “Wendy house mansion on stilts” perfectly emphasised both the shaky ground the upper-class society was built upon in 1912 and visually separated the comfortable elite from the desperate majority. Inspector Goole’s line of questioning unravelled the fabric that kept the Birling facade intact and the First World War helped shake the foundations as well. When an onstage explosion literally brought the house down, I guess it was a metaphorical representation of an equalling in society. Both the mother and son at one point were lying in the gutter apparently broken by their deeds. Yet when it looks like no suicide has been made by Eva/Daisy, the audience saw Mrs Sybil Birling rising slowly then becoming more assured in her manner. The old-world order had not been upset after all, which was a call for celebration. Only the young Birlings’ Eric and Sheila seemed traumatised by the whole affair and felt any kind of remorse for their actions. They realised whether Eva/Daisy had committed suicide or not, all of them at the dinner party were culpable for their actions in bringing about her predicament. The ending of course finds Arthur Birling being informed that a death has now occurred and the police will be arriving to question them. Everything they had been told was a prediction of what would happen that night. I discerned from my program a notion that only a modern innovative rendition of An Inspector Calls could bring the themes from the story into the present day. A traditional portrayal of the play could only make the Birling family seem like a relic from a bygone era, something from the history books. I disagree completely with this assumption having seen the recent BBC TV adaptation, which was excellent. It took place in a resplendent Georgian dining room with characters acting perfectly in dress, manner and behaviour of the times. The Inspector Goole of this version was quietly forceful with a beautifully measured manner and a pall of sadness about him. To me he was utterly believable, especially as he made me think of the narrator in the film The Book Thief, who was the voice of death like Goole himself. Being set properly in the context of 1912 magnifies the heart and soul of the play; it does not detract from it. The Titanic disaster, Suffragette movement, World War One and the ideals/wrongs of that time nourish and nurture the story. For me the traditional setting reinforced the themes from the play and I had tears in my eyes at the end of the TV drama. Alas I was a bit angry and rather cross having watched the stage production of An Inspector Calls. I’m sorry to say the themes that transcend the generations doesn’t work as a smorgasbord stage setting. It was exactly a year ago (Sept 18th 2014) that Scotland voted on a referendum for independence (see my views post), a mandate that was defeated by 55% to 45% (see my results post). British Prime Minister David Cameron at the time promised more devolved power to the Scots which may well have swung the vote to remain within the UK. He has not delivered on that promise yet and the SNP leader Nicola Sturgeon has spoken of the PM “living on borrowed time”, a view I can’t help but agree with. Both the referendum issue and the General Election result have had a profound impact on me, which I became acutely aware of on holiday in Brussels two weeks ago. Ever since my first visit to Brussels in 2002 I have adored the place and felt very comfortable there despite my linguistic short comings. English is beautifully spoken, menus are in various languages and even I can negotiate the French part of the dual language signage (the other is Flemish) for the metro and tourist spots. You just can’t help but know that you are in a city that prides itself in being at the heart of the European Union, something I’ve felt very relaxed about. But in 2015 on my fifth visit to the city I realised for the first time I was embarrassed by my own national identity, and it has all stemmed from my feelings regarding the political shenanigans that have gone on here for the last year. When politely asked which language I spoke I happily replied English. But the question “where are you from” stirred in me turmoil and I floundered to respond. Previously my reply would instantly have been Britain but this time I found myself saying that I had travelled from England but was a Scot, although basically we were all sort of British! I racked my brains to remember what we were called in the Eurovision Song Contest and of course it is the United Kingdom. 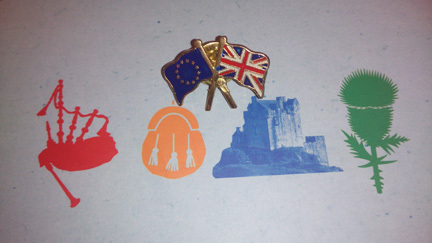 The museum clerk who had asked the question smiled at my eventual UK answer and commented “ah yes the UK like Belgium we are all European”, to which I ruefully responded “well for now anyway”. I walked away disconsolately feeling utterly hollow inside. England is where I live, but I had identified myself as a Scot in a mental attempt to put distance between me, the nationalistic UKIP party and David Cameron’s Tory England. The Prime Minister advocated the Scottish referendum debate, something I deeply opposed, because in my opinion it has begun the process where Scotland and England will separate in the future. His determination to have an IN/OUT vote to remain within the European Union could well be the catalyst for this to happen. Knowing all this made me somewhat hesitant and a little ashamed to admit my British nationality whilst in Brussels. But the internal political strife of this country is little known within the EU, for now anyway! Before David Cameron relinquishes his tenure as British Prime Minister, he might guide the nation into sleep-walking out of the European Union and preside over the disintegration of the United Kingdom. My passport is for the United Kingdom of Great Britain and Northern Ireland but sadly under Cameron’s government I no longer feel the country is great, nor the kingdom united. The massive flux of people travelling toward the continent of Europe from many troubled lands has made headline news in 2015. But the first week of September has seen an apparent seismic shift in how European heads of state deal with the problem. It seems that a photo of a small child from Syria drowned in the Mediterranean Sea and washed ashore, and hundreds of people walking from Budapest to the Austrian border have been the galvanising moments in the story. I was on holiday effectively from the 1st to the 5th of September and did not take my smart phone with me, nor did I watch the news at my hotel in Brussels. On my return home the headlines emanating from Hungary, Austria and Germany were literally “news” to me. Suddenly with the situation becoming dire in Central Europe and Hungary seemingly throwing its hands in the air in despair, the rest of the continent woke up. The problems that Italy and Greece have been dealing with on their own for months almost buckling under the pressure, and pleading for help with the situation have come home to roost so to speak. Finally an attempt at a cohesive joined up effort to deal with the issue is taking place. Or at least that’s how it seemed watching reports on Saturday 5th September, but 24 hours later the political “goodwill window of opportunity” was already being talked of being suspended soon. But in the meantime, transport is being put in place to offer safe passage from Hungary to Austria and Germany (and perhaps beyond) for the thousands of displaced people seeking refuge. Some may say that the open borders policy of the European Union enshrining freedom of movement has in part created the problem. However, the humanitarian effort today is only possible because of those same laws that bind the European Union nations. I don’t think the necessary diplomatic dialogue channels would be in place otherwise. Germany looks to be prepared to take several hundred thousand displaced people, whilst early speculation has suggested that David Cameron may take in about 15,000 to the United Kingdom. I’m not overly enthused by the Prime Minister’s stand on this issue, as he only seems to have reacted because he has been backed into a corner. Looking bad in the eyes of other European leaders is no strange notion to the UK political leader, after all our demands for European renegotiation and rebates etc doesn’t make us popular. But if the UK appears to be not “pulling its weight” in this matter then why should our “bleating” be given a fair hearing. Yet if the UK doesn’t get some kind of rebate/new membership terms from Europe as Cameron has promised his electorate he will strive to do, he loses face with the very people who got him into power. The brief amount of news coverage I watched on Saturday night included seeing Germans applaud the arrival of people disembarking from trains in Munich, and a chat with a Syrian family recently settled in a small German community of 1200 in size. The woman of the family spoke of gifts being given to them within days of arrival (TV, bikes for the children) and the warm welcome received. I was glad they felt safe and secure but couldn’t help wonder how different their story may have been here. Germany as a nation has a general policy of wide scale social housing availability, home ownership not being the norm. Unsurprisingly then the Syrian family had a fair chance of being offered a roof over their heads once their asylum paperwork had been processed. The United Kingdom on the other hand has wide scale home ownership, has given away for sale most of its social housing in the last thirty years, and not replaced anywhere near the same amount lost. There are large waiting lists for social housing and many have become homeless due to the lack of suitable affordable homes. So when the news triumphantly reported that “many in the UK have volunteered to take refugees in” my views were a little less charitable I’m afraid. Home owners with room to spare are about the only ones able to offer an instant “roof over the head” solution. Local councils have to juggle their waiting lists with available housing stock, and anyone in housing authority properties or private tenants would be in violation of their tenancy agreements, to take anyone unauthorised into their home. Under those circumstances I think any refugee family housed by the council would probably be viewed with suspicion and could face having their windows put in! Not a very nice welcome. Austerity measures in the UK have seen many basic services funding being cut back to a minimum. We hear reports of NHS difficulties in providing comprehensive cover at weekends, some areas with not enough school places, council subsidies for local transport being reduced, to name but a few. These issues show what a potent mix of “general disgruntlement” we have in this country at the moment, and that is without even mentioning “benefits” to provide a social income for displaced people. Of course the UK should help people in need, but that does rather depend on our infrastructure being robust enough to provide them with all they require for a decent life. Looking at our society today I’m not all together convinced we are doing a decent enough job looking after those who are already here! 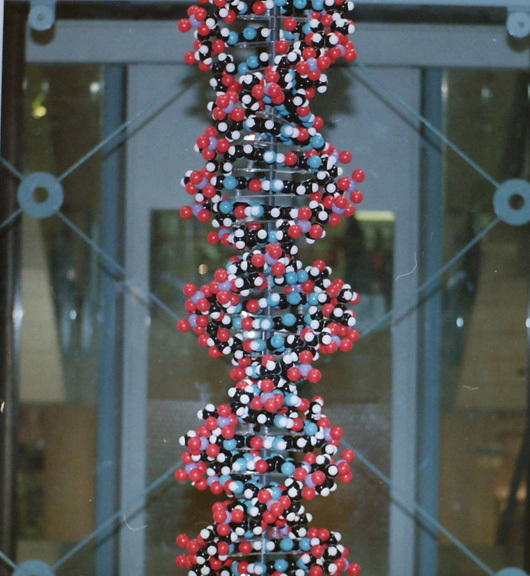 The city of London won the honour to host the 30th Olympiad on the 6th of July 2005. My husband Rob knowing I had already volunteered at the Manchester Commonwealth Games in 2002, read my mind when he said “you’ll want to get involved I suppose”. So the next morning (7/7) he registered my volunteer interest online, whilst I travelled on an early morning National Express bus to London, with the intention of seeing the matinee of Billy Elliot the Musical. The bus was late running by an hour but I was not unduly concerned, as I had given myself plenty of time between arriving in London and the start of the show. However, I never got to see Billy that day, as the 7th of July 2005 would become synonymous with multiple bombings occurring around the city. News of these terrible events began filtering through (via text and mobile phone messages) to people on the coach with me. We travelled as far as Luton airport before our driver was instructed to stop and turn back. He was a bit shaken up because he realised that had he not been late running, he would have been driving through an area affected by the bombings and probably diverted as a result. He knew the diversion could well have taken him past Russell Square, at about the time of the bus bomb! So he wasn’t in any mood to go on but London had effectively shut down for the remainder of the day anyway. Many if not all the theatres closed for business, including the Victoria Palace showing Billy Elliot. For both Rob and I the news of the bus bomb at Russell Square was particularly unnerving. We know that area very well, as the “cheap and cheerful” County Hotel we used regularly is almost next door to the British Medical Association building, where the bus bomb had detonated. We were due to stay at The County on the evening of 7th July because of my theatre plans and Rob was due to give a seminar the next morning. Of course we never got to the hotel as I didn’t reach my destination, and Rob could not physically get to London by public transport on the evening of 7/7. But undeterred Rob was on the 0711 train from Crewe to London on the 8th to give his talk at the Royal Institution later that morning. On the evening of August 2nd 2005 I did eventually see Billy Elliot the musical, and it was wonderful. Having read about Rob Lowe doing “A Few Good Men” at the Theatre Royal Haymarket during the autumn, I secured my ticket for a 20th September show the next day. I later read in a newspaper interview that Rob Lowe had been finalising his plans for travelling to London when news of the bombings had broken. He could have backed out of doing the show, but stated that had he done so “the bad guys would have won. The way to beat them is to carry on”. I couldn’t have agreed more. As I reflect on the events of ten years ago it is a sobering thought to know that had my National Express bus NOT been delayed by an hour, I may well have been caught up in the middle of the atrocities. I should have been dropping off my over-night bag at the County Hotel around the time of the bus-bomb! Talking of my “near miss” with an old school teacher friend a couple of months later, I discovered her son’s partner had been on a tube train just a minute behind one that had been blown up. Mrs Mitchell emotionally remarked “to think I may have known two people involved in those awful atrocities”. Thankfully that hour and that minute made all the difference.